The legacy of the Qutb Shahs and the Asaf Jahs, two of the wealthiest royal houses in India and indeed the world, still shows - ornate mosques, glittering palaces and grandiose tombs decorate the city. And this legacy can also been seen in the best places to stay in Hyderabad, where you'll find palace conversions and the renowned service and luxury of the Taj brand. Hyderabad’s Old City is made up of winding lanes, bustling market places, crumbling architecture, chai stalls and a meandering cow or two. Nowadays, Hyderabad has a ‘Twin City’ in the form of the modern metropolis nicknamed Cyberbad. With shopping malls, restaurants, nightclubs and plenty of top class hotels, it's the favoured spot of the city’s bright young things. Hyderabad is famed for it Biriyani and Bawarchi, a bustling favourite of the locals, is widely renowned as the best restaurant in city. A ride out of town (just over 10km), the impressive Golconda Fort, built by the Qutb Shahs in the 16th century, is a must visit. Combine this with a visit to the family’s equally as grand tombs, just 2kms from the fort. With a thriving film scene and plenty of multiplexes, why not catch the latest Telugu film for an insight into Hyderabadi culture. Or, head to Ramoji Film City to learn all about the area's rich film industry. The gorgeous Birla Mandir temple, made entirely out of white marble, is a stunningly serene spot with wonderful views of Hussain Sagar Lake from its elevated position. Be sure to spend a few hours at the Salar Jung Museum, home to a fascinating array of artefacts and statues spanning the centuries. A splendid visit. Always a popular destination, book your room in one of the best places to stay in Hyderabad well in advance so that you're not disappointed. 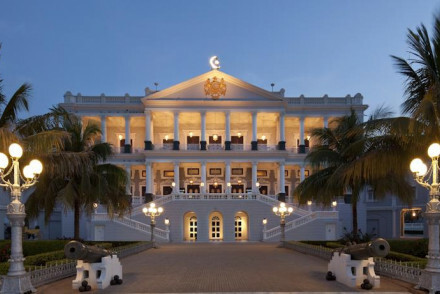 Two thousand feet up, with 360-degree views of the city, lies the resplendent Taj Falaknuma Palace. The former home of Nizam Mehboob Ali Khan, it underwent a ten year makeover and now offers just 60 rooms, each more glamorous than the last. It is quite literally fit for a king! 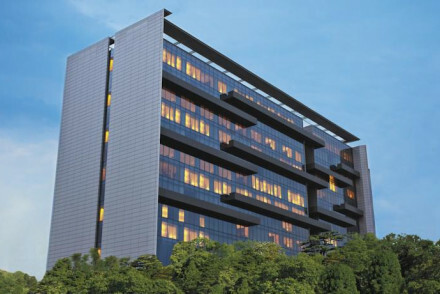 For chic, modern luxury and a central location the Trident Hyderabad has rooms to suit most budgets. Ideal for business travellers with it's great position in the CDB. Welcoming guests for decades, Taj Banjara, complete with an English style pub, is a welcoming and comforting stay with all the amenities you would come to expect from this global chain. If you think a self-catering option would best suit your needs then browse through the wide variety available online with our partner, Booking.com. You're best off visiting Hyderabad between October and February, when the average daily temperature ranges from roughly 22-25°C. March to May constitutes Hyderabad's summer and so it is far too hot during the day to comfortably wander around sightseeing, whilst June to September is monsoon season which brings lots of rainfall and increased humidity. That said, this is the off season and so expect accommodation to be cheaper at this time of year. British Airways fly direct from Heathrow to Hyderabad, with the journey taking just over 9 hours. From the airport, either hop on the Pushpak buses which stop off at various points around the city (and vary between £1.70 and £3.00), or take a cab to your final destination. From palatial to classic luxury, browse through our list of the best places to stay in Hyderabad to start to plan your trip. Widen the net to include our recommendations for the best places to stay in Goa, Pune or Mumbai. Set atop the Banjara HIls with views across its own private lake and Hyderabad in the distance. Rooms are decorated in a classic style with mahogany woods and pale blue and green silks. Kebab E Bahar does evening barbecues whilst Waterside Café is on the lake. There is an inviting pool and spa. Value chic - A stay at a Taj property from £52 is superb value. Local markets - Laad Bazaar is great for Indian trinkets, clothing and gifts. Sights nearby - Built in 1591 the Charminar is a historic monument. Cooking classes - Alka's Cooking Academy comes highly recommended. 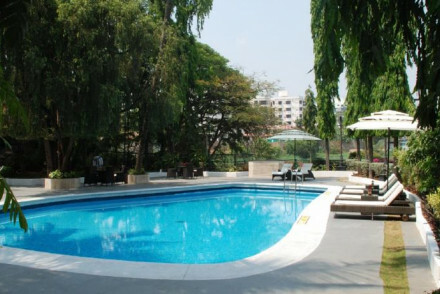 Located in Hyderabad's CBD this Trident property is primarily a business hotel, but its suave interiors and five star facilities mean it provides a luxurious stay for all. Large rooms enjoy floor to ceiling windows plus deep baths and power showers. There is a stunning infinity pool, gym and spa. Sights nearby - Golconda Fort a 16th century military town of the Qutb Shahs. Swimming Pool - Infinity pool on the 10th floor offering great city views. Great walks - Walk the 500 steps to the Moula Ali Dargah. Cooking classes - Learn the art of the Hyderabadi biryani. If you are a fan of Taj palaces then this is the cream of the crop. Sitting 2000 feet above the city, resplendent amidst 32 acres of manicured lawns, Falaknuma takes your breath away. Perfect pastel bedrooms are brimming with antiques and India's finest silks. Foodies will love the grand dining. Great walks - Walk through the well maintained gardens surrounding the ancient Qutub Shahi tombs. Cooking classes - Learn the art of Hyderabad's famous biriyanis at Alka's Cooking Academy. Sights nearby - Chowmahalla Palace is well worth a visit for more historic charm.